Lower North Santiam River Restoration Alternatives Analysis (OR) | WEST Consultants, Inc.
WEST Consultants supported River Design Group (RDG) in the development of floodplain and off-channel habitat improvement projects along the lower North Santiam River. Working for the North Santiam Watershed Council, WEST and RDG have developed and evaluated various restoration alternatives including secondary channel connection improvements and levee removal. WEST developed a 2-dimensional HEC-RAS hydraulic model of the North Santiam River. The model extends approximately from Stayton to the Hatch Airport. The model shows the connectivity between the main channel and secondary channels, including Diekman Creek, and the floodplain for various river flow magnitudes for existing conditions and for each of the various habitat improvement alternatives. 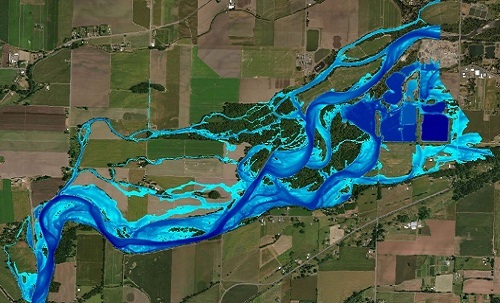 The model allows the Watershed Council to understand how much additional secondary channel and floodplain connectivity would be expected from each alternative, providing a basis for ranking each alternative. As part of the alternatives analysis, the changes in flood risk to surrounding properties associated with each alternative were determined. This was done to help understand and communicate the impacts of each alternative with the Watershed Council and project stakeholders. It will also be one of the criteria used for the selection of the preferred restoration alternatives.